Two Deck Recipes. One is based on how to use the new Dinosaur-Type support from Collector’s Pack 2017, while the other is a rather odd amalgam of Superheavy Samurai and Gouki. A Deck that combines the “Gouki” along with “Superheavy Samurai” cards that debuted in Collectors Pack 2017. “Gouki The Great Ogre” works well in tandem with “Superheavy Samurai” monsters who treat their DEF as ATK during damage calculation. In particular, if you destroy “Superheavy Samurai Stealth Ninja” as a substitute via the 2nd effect of “Gouki The Great Ogre”, during your next Standby Phase, it can be Special Summoned from the Graveyard. 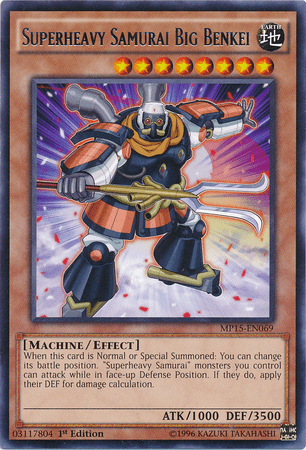 In case of “Reinforcement of the Army”, “Limiter Removal” and “Gouki Re-Match” or so such Spell Cards in your Graveyard that would interfere with the effects of Superheavy Samurai monsters, you can banish them from the Graveyard with the effect of “Treasure Panda”, which will let you Special Summon a Normal Monster Tuner from your Deck, which you can then use to Synchro Summon.